SoftBank and Bloom Energy announced today they will begin offering fuel cells this fall as an alternative off-the-grid power source in Japan. The 50-50 joint venture will target corporate offices, data centers, hospitals, government centers and other large buildings that would benefit from multiple power sources. Each fuel cell system generates enough electricity to power 500 homes. The cells also offer a way to decentralize power. They are completely separate from the national energy grid and generate power onsite. If another disaster hit and an area’s primary fuel source was taken out, a fuel cell could take over. This is often how they’re used in the U.S. at data centers, where companies can’t afford to ever lose power completely. Fuel cells are cleaner and more efficient than fossil fuel energy sources, but more costly. SoftBank and Bloom Energy say the cells offer a stable alternative to rising electricity prices in Japan. Clients will pay for the initial cost of the cells over the course of a 20 year contract. SoftBank and Bloom Energy are each investing 1 billion yen — a total of roughly $20 million — to start Bloom Energy Japan Limited. Bloom Energy is based out of Sunnyvale, Calif., and has provided fuel cells to American corporations like Apple, eBay and Verizon. Japan Limited is its first venture outside the U.S. SoftBank owns a range of telecommunications, internet and technology companies, including Sprint Nextel, which it acquired this month. 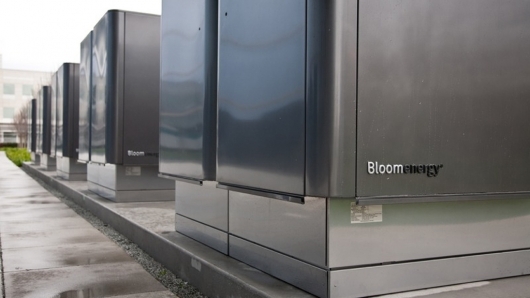 Bloom Energy’s fuel cells run off natural gas and biogas, as opposed to the more common hydrogen. The gas is modified and exposed to oxygen, creating a chemical reaction that produces electricity. A small amount of carbon dioxide is released as a byproduct.